In the central U.S., sizzling summer temperatures don’t just cause discomfort for those fighting to stay cool. A combination of unique atmospheric factors makes America’s midsection especially susceptible to summertime ozone loss, putting millions of Midwesterners at a higher risk to contract skin cancer. Intense summer storms cause a phenomenon called convective injection, where water vapor is thrust high into the lower stratosphere, interacting with atmospheric chlorine and setting off a chain of chemical reactions leading to a risk of increased ozone depletion, according to research conducted by James Anderson, Philip S. Weld Professor of Atmospheric Chemistry at the Harvard John A. Paulson School of Engineering and Applied Sciences (SEAS). Working under Anderson’s instruction, and in collaboration with Aurora Flight Sciences, a team of students in Engineering Problem Solving and Design (ES 96) developed an instrument to measure the concentrations of stratospheric chemicals that cause ozone depletion. In ES 96, students work as a team with a client to define an open-ended, complex problem, create a systems analysis, and propose a solution. Plans call for the instrument to be used to conduct atmospheric chemistry research next summer aboard an innovative, solar-powered aircraft that will fly high above the Midwest continuously for three months. The students’ instrument measures stratospheric concentrations of bromine and chlorine, capturing detailed data that will be used to analyze trends in atmospheric conditions and ozone depletion. To effectively obtain a continuous flow of air, the students designed the instrument for placement onto a thin mast atop the body of the aircraft. The free radicals their instrument will capture would be destroyed if they collided with a surface, so ensuring free airflow during flight is crucial, explained Ryan LaMonica, S.B. ’18, a mechanical engineering concentrator. This rendering shows how the instrumentation-holding device the students developed would be mounted to the mast atop the aircraft, enabling more effective continuous atmospheric measurements. Once air enters the device, an atomic emission lamp emits light at different wavelengths that excites chlorine and bromine atoms. Electronic components detect and count electrons, calculating chemical concentrations by drawing comparisons with the overall amount of air inside the flow tube. Designing an instrument for a solar-powered aircraft involved distinctive challenges. The device must weigh fewer than 25 kilograms and use less than 250 watts of power. In addition, the instrument must operate effectively in lower stratospheric conditions where temperatures can dip to negative 70 degrees Celsius and air pressure is one-tenth that of Earth’s surface. 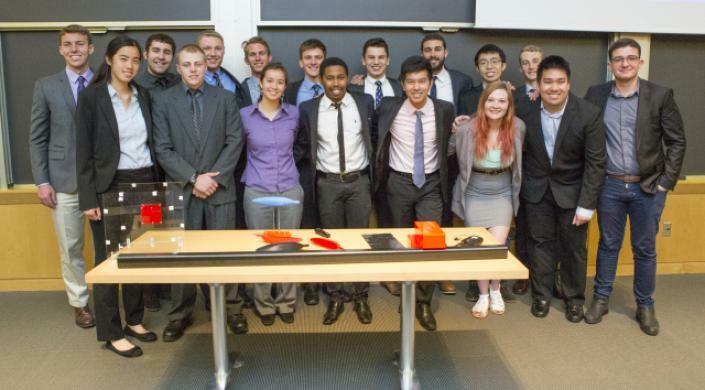 Those harsh conditions challenged the students’ engineering know-how, said Rico Stormer, S.B. ’18, a mechanical engineering concentrator. With their prototype complete, the team has ordered parts to build the instrument, which will be assembled and tested over the summer. They plan to make design changes as needed to shave off weight, but the team is confident their instrument will be ready for launch next summer. “If we find out that convective injections are actually correlated with ozone depletion, that gives incentives for governments and larger scale organizations to make changes in the way we address these problems, which could spark other innovations in stratospheric chemistry and change how we think about geoengineering,” said Aldís Elfarsdóttir, S.B. ’18, an environmental science and engineering concentrator. “It's thrilling to know that next summer's ozone depletion research with our chlorine and bromine radical detection instrument may make a big difference and help us fight anthropogenic global climate change." Mike Humphrey, a mechanical engineer at Aurora who advised the students, was pleased by how well the team of 20 came together to achieve goals effectively and efficiently.